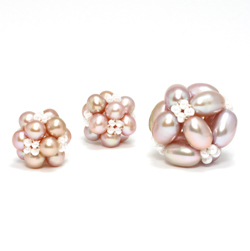 The Light Clusters beaded bead is a simple, elegant design perfect for showing off shiny pearls or semiprecious stones. Woven as an octahedron with the triangle weave, this design can be created in multiple sizes for a sturdy solo pendant, a delicate pair of earrings, or a complete set of jewelry. The Light Clusters beaded bead can be strung through two openings for two distinct styles.